The Torres Strait Islander flag symbolises the unity and identity of all Torres Strait Islanders. The Torres Strait Islander Flag is attributed to the late Bernard Namok of Thursday Island. His flag was the winning entry in a design competition run by the Island Coordinating Council (ICC), a Queensland statutory body representing the Community Councils in the Torres Strait. The flag was adopted at its Council meeting on 24 March 1992. The flag features a white Dhari (traditional headdress), with a five-pointed white star beneath it. The Dhari is a symbol of Torres Strait Islanders and is used in cultural ceremony and dance. The white five-pointed star symbolises peace, and the navigational importance of stars to the seafaring people of the Torres Strait. southern islands (Kirriri (Hammond Island), Waiben (Thursday Island) and Inner Islands, Northern Peninsula Area and Mainland Australia). 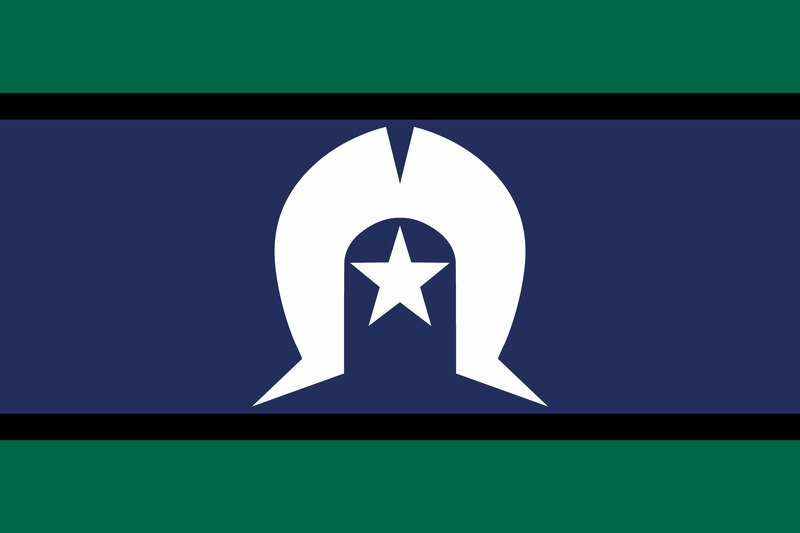 The deep green stripe represents the land, the black stripe is for the people, and the blue is the colour of our seas. The flag was officially recognised and presented to the people of Torres Strait on 29 May 1992 at the sixth "Torres Strait Cultural Festival". In the same year, it was recognised by the Aboriginal and Torres Strait Islander Commission (ATSIC) and given equal prominence with the Australian Aboriginal Flag. The Federal Government initiated steps in 1994 to give the flag legal recognition. After a period of public consultation, the Government decided in July 1995 that the flag should be proclaimed a “Flag of Australia” under section 5 of the Flags Act 1953. The flag was proclaimed by the Governor General of Australia, William Hayden, on 14 July 1995. We and our 15 communities own the copyright of the Torres Strait Islander Flag. permission must be received in writing from us, prior to its use. To request permission to reproduce the Torres Strait Islander Flag, contact us. Allow 10 business days for your request to be processed. You do not need permission to fly the Torres Strait Islander flag. But, if you have any questions about how and when to display the flag, contact the below.